For the University of Saskatchewan and Saskatoon Symphony Orchestra investigation into brain activity, violinists wore portable electroencephalography caps – data from the caps was fed into laptops for analysis. Music plays an important role in our lives – from jingles that help sell everything from candy to cars, to the familiar tunes that mark celebrations like weddings and birthdays. Now, in what is believed to be a first, researchers are investigating whether synchrony between performers’ brain activity causes beneficial brain activity patterns, which may contribute to a sense of well-being after performing together. A University of Saskatchewan (USask) research team, led by psychologists Janeen Loehr and Jennifer Nicol, has been working with the Saskatoon Symphony Orchestra (SSO) to measure brain activity from multiple musicians during a live performance. The team hopes to publish a research paper on their findings in 2019. Dr. Loehr, principal co-investigator, notes that in previous research increased alpha brain wave activity on the front left side of the brain has been associated with listening to music and with happiness. “This research was a really exciting opportunity for us to measure brain activity from multiple musicians during a live performance and outside of the lab,” she says. Dr. Nicol, co-investigator on the project, says there is plenty of evidence that group musical performance has psychological benefits such as increasing well-being and reducing stress and anxiety, but exactly how that works is still a mystery. This research project is the first initiative under a new memorandum of understanding between USask and the SSO. “While this is the type of high-level research that could happen anywhere, it’s thanks to the connections we’re building between the symphony and the university that this exciting experiment gets to happen here,” says SSO executive director Mark Turner. 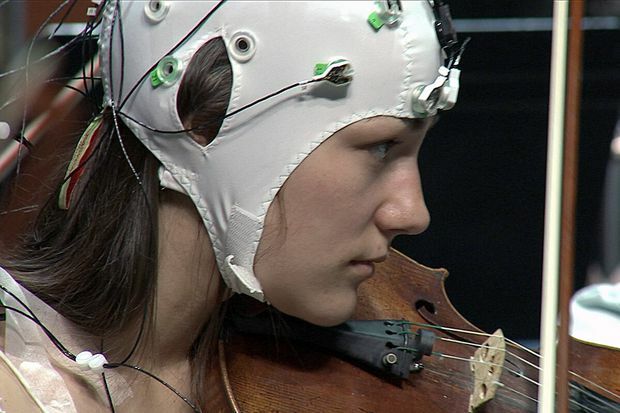 The research team fitted violinists with portable electroencephalography (or EEG) caps on their heads. Signals from the caps were fed into laptops for analysis. Dr. Loehr and Dr. Nicol also plan to use the EEG equipment to examine the benefits of music therapy at the brain level. “For instance, we may be able to record brain activity between a music therapist and a client,” says Dr. Nicol.